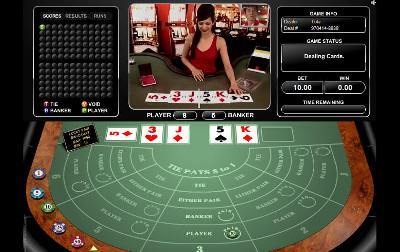 Baccarat played online but dealt by a real dealer using real cards. Vision of the deal is streamed live to your PC allowing you to play the game real-time. Yes. Game features and appearance do vary quite a bit from one casino (and its software licensor) to another. You can check out a comprehensive list of live baccarat games here. Most casinos offer ‘standard’ baccarat rules – that is to say the same rules you’d find at most terrestrial casinos. Often the game is presented in ‘Mini’ baccarat (ie single player) or Punto Banco format, but the rules payouts for Banker, Player and Tie bets are essentially the same. 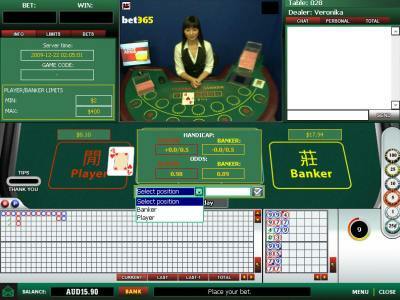 There are also a number of variations offered to the standard baccarat game. These may offer side bet, progressive pots or different odds applying to the Banker, Player and Tie bets. For a nice discussion of rules applicable to the all live baccarat variations, we suggest you visit this live baccarat summary page. 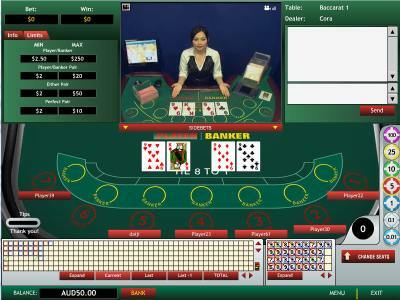 Mini live online baccarat: Same rules as above just a cut down single seat table layout. Sometimes also referred to as Punto Banco. Again, the screen shot below is taken from a game played at bet365. In-running live online baccarat: In-running side bet offered during the course of the deal with calculated odds and handicaps. Again, the screen shot below is taken from a game played at bet365. 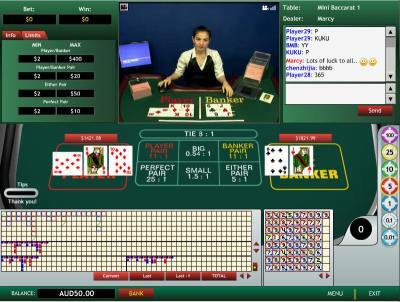 Pairs live online baccarat: Pairs side bet offered on first two Banker and Player cards dealt. The screenshot below is taken from a game played at Platinum Play. Dragon bonus live online baccarat: Optional side bet on what the exact deal outcome will be, paying up to 30:1 for a non-natural hand win by 9 points. Progressive live online baccarat: Optional side bet on the progressive jackpot. Zero commission live online baccarat: No house commission Banker wins, but a Banker win with 8 points pays 1:2 instead of the normal 1:1.